I am here today with some tough love. Because I do love you and I know this homeschooling your kids thing is important to you. And yet, you struggle with homeschool consistency. Homeschooling won’t work unless you do it consistently. As in most days. As in not taking off more unplanned days in a year than your husband would be expected to take from his job. Go ahead — count up his paid time off — that’s your grace period for the school year (not counting your holidays and planned time off). Anything more than that you can consider “excessive.” Hey, I promised you tough love. I know you beat yourself up for your inability to maintain a routine. Twenty mental lashes, hours of guilt and remorse, promises to yourself do better. But the promises don’t last much past a month of Mondays and you are back to your old, inconsistent ways. That’s because you are missing a vital element — the why. There are specific reasons that homeschool consistency comes hard, but until you get to the bottom of those reasons, Self, and work past those challenges, then you will continue to strive, struggle, and fail. Your reasons may not be the same as your neighbor’s, but I would bet one or more of these are causing you to struggle. 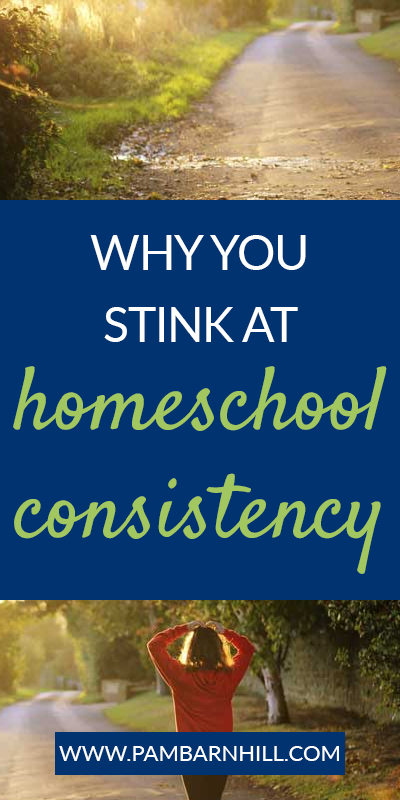 It is entirely possible that your consistency issues start each morning long before you even consider homeschooling. You can’t wake up at a decent time because you failed to go to bed the night before. The kids’ breakfast is congealing on the countertop while you shuffle around in your pajamas yelling at everyone to get their teeth brushed and get started on that math worksheet while you shower. As soon as you leave the room, World War III breaks out and you return for the fifteenth time to yell, threaten, and wonder why a 9-, 7-, and 5-year-old just can’t do five minutes of math without you. The truth is, your morning is a mess. 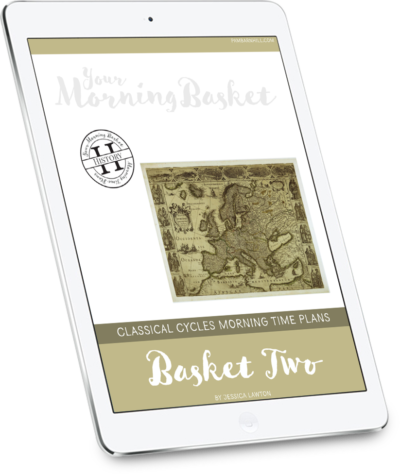 Until you get some good habits in place to get your morning off to a good start, you will continue to struggle to get your homeschool off to a good start. You don’t need to wake hours before everyone else, make a breakfast from scratch, spend an hour reading hard books, or writing in a journal. You DO need a few simple habits in place that will help you go to bed on time and get ready quickly in the morning. Mothering is a full-time job and homeschooling is another part-time job on top of that. So you don’t have one job, you have two. You wouldn’t shirk your duties as a mom, so do not shirk them as a homeschooler. 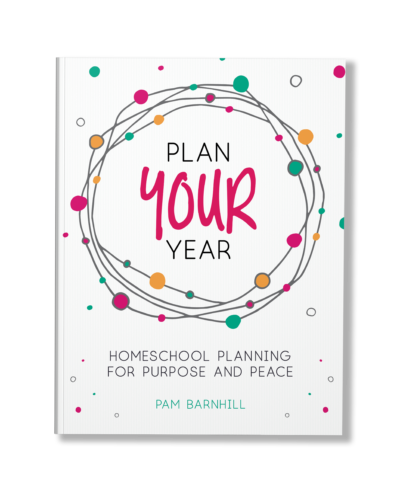 Protect your homeschooling time as valuable by telling family and friends the hours each week you do school and expect them to honor those hours — yes, even your husband. While homeschooling, like any work done from home, affords us wonderful flexibility, the work still has to be done to see the reward. Use the Weekly Planning Sheet from the Plan Your Year free mini-kit to mark off the hours dedicated to school. Use the annual calendar to pre-plan days off. Then, commit to keeping that work schedule like your husband commits to his own. Appointments can be scheduled for 1:00-3:00 PM — still within the public school day for lighter crowds, yet late enough to afford you a chance to get a good day of learning in at home. Errands can wait for a single day every other week. Groceries can be purchased in the evening as other working mothers have to do. You’re not fooling me. I know that many times you simply don’t do anything because you know you can’t execute something perfectly. 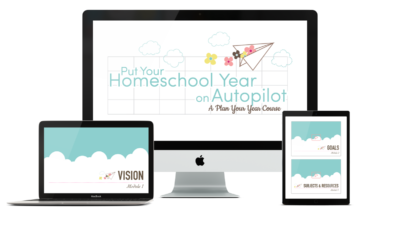 You read about an activity in a book or on a blog, saw something on Pinterest or Facebook, have a new idea from a friend to add to your homeschool day that would make things perfect. And yet you don’t have all the supplies you need, or the weather isn’t right, or you’re waiting on a book from the library or the UPS man to deliver an order. So you sit and do nothing instead, using this as an excuse to put off school for a few days because your plans won’t be perfect. The kids don’t need perfectly executed, Pinterest-worthy lesson plans. They need consistent work on skills like writing and math. They need to read and be read to. They need action. I know what you say. You’re spontaneous. I get that. I also get that you feel if you don’t have anything written down to do then you can never fail to meet your own expectations. I get that too. But honestly, you are cheating your own peace of mind by not having a simple plan in place that defines your minimum school day. On a day that is going horribly wrong, started badly, is filled with appointments and the unexpected what is the minimum you need to do in order to feel good about your homeschool that day? Is it Morning Time and math? Latin and phonics? A good read aloud and a historical documentary? The minimum school day is going to vary from family to family, but if you have a plan for it and know that is your to-do list for those bad days, it does wonders for your conscience. No longer is your day defined as good by checking a long series of boxes, but instead by accomplishing two or three of your most relevant, most important subjects. These subjects don’t make an entire education, but they do make an emergency plan you can feel good about using. This is the biggie. You could never look your homeschool girlfriend in the eye and tell her your struggles. After all, her homeschool looks so perfect (not to mention her house and clothes as well — sheesh, how does she do that?) Surely she wouldn’t get it. This problem, though, is more widespread than you might imagine. Homeschool moms all over the world struggle with it daily in silence when instead they could be owning up to their problem and seeking support from each other. By having others to be accountable to, you will have the support you need to work through some of the reasons listed above and find solutions to your consistency issue. By providing support to others you will work hard not to let them down and help provide solutions to their concerns. It’s a win-win. If you think this post is too harsh you can read this. For more tools like this and help with consistency in your homeschool, check out our Homeschool Consistency Bootcamp. We are opening it January 31, 2019 and you can click to get on the waiting list below. I want to be consistent! Loved this post. I struggle with this ALL the time. Literally 5 mins before I got the email about this post I was praying for help on this very issue. It is my #1 struggle. I was prompted to check my email again, even though I had just looked at it, and there this was! Thank you! If I shower and have my quiet time before my kids are up it makes the biggest difference in my day. If I’ve had a rough night I give myself grace to sleep in but I know there are consequences from that choice. I find that have a check list for my student that I made at least the week before helps keep us all accountable. If I were to make it day-to-day I would find all sorts of reasons why we couldn’t stick to our schedule. Thank you for your honesty and the reminder to be honest with others in our circle of friends. Wow! Thanks so much for speaking truth to me this morning. Off to get my shower…? It’s good to know that I’m not the only one struggling with ALL the above lol. Thank you for this post. It really was much needed. Looking forward to next week’s post. Dear Pam, thank you. Thank you, thank you. It’s about all I can get out right now. There are tears. I’m going to read this several times today, I’ve been really working hard this week to evaluate and organize and this email was JUST what I needed. From the bottom of my heart, thank you. I am so used to hearing and reading about how flexible our homeschool can be, that sometimes we relax a bit too much. This line hit me like a ton of bricks, “You don’t treat your homeschooling as a job. ” Most mothers take their job of parenting seriously, and it should be no different with our children’s education. Thank you for pouring a bucket of cold water over my head this morning. I needed to hear this! Beautiful post Pam, love your candor and offer of solutions…as always. Yes yes yes! This is exactly what was on my mind this morning!! I have been letting mornings get too relaxed…ie staring at Instagram and FB on my phone while I’m making breakfast and then getting annoyed with my kids when they don’t stay on track with the morning routine…mommy fail. From now on phone is staying upstairs until school is over for the day! Thank you so much for this! We have to do homeschool testing in about a month, and I was literally feeling like such a failure as a homeschool mom yesterday. Academically, we are not where I was hoping we’d be by this time. I was feeling so frustrated with myself and oh. so. discouraged. I was still feeling that way this morning, and then I opened my email and read your post. It literally brought tears to my eyes. Thank you for this “kick in the pants” post, and I’m looking forward to the information next week regarding consistency! Lord knows I need it! I NEEDED this. Thank you for sharing, Pam. AMEN! Printing. Thank you so much!!!! Gabrielle, this is exactly what I was just going to write. I wake up before my girls just about every morning. Have bible study and shower. If I ever miss my morning time, it takes until noon to get into a good groove. I don’t do well with the whole flexible homeschooling thing. Flexible to me equals…not at all or only half way done and feeling bad about it. The whole house does better with a routine. Thank you for your wise words! Loved this timely kick in the pants. 🙂 Consistency has been waning the past few weeks. Thanks for the exhortation to get back on track, Pam! Guuuurl….stop! This was totally on point. Eek! Buuut it’s spring! ? Thank you for the kick in the pants!! Bravo. Definitely what I needed to hear today. I might have played hooky today because of my many good excuses ( two-month-old, didn’t sleep well last night, I want to organize my closet, the neighbor boy is on spring break, I have to get groceries… You know the drill.) Have to get back on the horse tomorrow morning. This post actually brought me to tears! The knowledge that I am not the only one struggling with these issues is the best gift you could’ve given me. If you listen closely you can probably hear my sigh of relief. Thank you. Thank you. That was such timely advice. Thank you! I’m not homeschooling yet, but this is me even before I start. I’m posting this insightful and very applicative reminder on my wall. Thank you, again. I am ready to walk away I’ve become so unorganized. It was like a slap in the face… but it’s a good thing. I mean – if I had been this unorganized in my career, I’d have been fired. LOVED this. So much. It is so incredibly humbling to get this kick in the lants. We are so far off track this school year that we won’t be getting a summer break. But this has motivated me to get my hand back on the plow. Thank you! For the last several months I have been struggling to Homeschool even thought about giving up. ( I say that but never will) I felt like I was stagnant. My word for the new year was Consistent. But still I struggled. Just this past few weeks I feel like I slowly coming out of what ever cave I have been in. Then just last night I ran into your post. It truly was heaven sent. No seriously!! Who can write everything I’m going through. Thank you!! I will be waiting on the next post. Be honest, do you have a camera in my house and a line into my brain? Almost all of these I struggle with (except not having a plan – I plan TOO much, then get overwhelmed feeling like I can’t do it all… yep, that’s the perfectionism). Thank you, this post is just the catalyst I needed to make some REALISTIC changes. Just what i needed to hear. Thank you. What is the free mini-kit you referred to? This post came at the perfect time. I just had to have a come to heads battle with the whole “family interruptions” issues within my family. I told everyone that they best enjoy this freedom this week, but come next week it STOPS. I hope and pray daily that it gets put to rest. My kids are brilliant. When they work, they dive in with a vengeance and put everything they have into it. I’m always impressed with how much they learn despite our long list of interruptions in our day. Thank you for this post! I have someone else helping me to voice what needs to be said now. It helps me to not be in this battle alone. Oh how I needed this! I have homeschooled for 11 years (and still have a looong way to go!) and I can tell you the only consistent thing about home schooling is it’s inconsistency. Because it’s HOMEschooling. School at home means that there are always things that disturb a routine. While it’s so good to do a self-check and make sure we are doing the best we can and make changes here and there, my personality a few years ago would have taken this post and used it against myself as condemnation and my perfectionism would have kicked in – which would have made me even more stuck and I might even have considered not home educating anymore at all! Schooling as many days as your husband works is ridiculous. Our children are “in school” 24/7 and if I start counting days we are “doing school”, I’ll quickly make myself crazy – and even feel upset if I, or one of my children get sick and mess up our schedule! I don’t see parenting as my job… A job means I can change, leave for off hours and take holidays. Parenting isn’t my job, homeschooling isn’t my job. They are my passion and my love. It’s hard work, but I do it because it is my calling. I think this letter to yourself could have used a lot more self-love and acceptance for where you are at in this stage of your life. For the incredibly hard work you are doing – and a gentle urge to see where you can make changes that make you feel better equipped to take care of yourself, your parenting and your homeschooling. I find that when we ask ourselves 5 whys about why we are feeling so out of sorts, it’s easier to come to a conclusion that boosts us up instead of making us feel hard on ourselves and condemning of our actions. Yes, we all struggle with consistency, with a framework – but seasons come and go. We have seasons of great productivity… and then I hit my pms stage of the month and suddenly all productivity halts – because I have a hard time not hurting little hearts when my hormones are raging mad. So it’s a season of playing and watching movies, more rest. And then it comes around. I’m in a season of late nights because… teenagers who want to talk. So, our mornings are not as “productive”. It’s a season. I see that soon my son will leave home and I won’t have these times with him anymore, so it’s ok to take them all as they come. Be gentle with yourself while spurring yourself on to doing maybe 1 or 2 things differently, better. Small habits that become ingrained and make life easier. And a lot more grace for yourself. 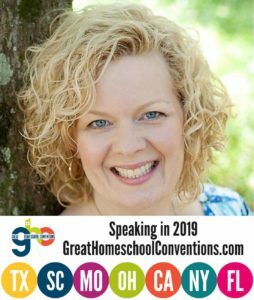 I worry that you have just heaped a pile of condemnation on younger homeschooling moms who will take this as “I needed it” – when what they needed was more grace with maybe a few ideas of how to improve 1 or 2 small things towards a better routine. Amen, Pam! Your post was exactly what I needed and I am so grateful that you took the time to share it. I have spent some time in prayer since reading it and I came to realize that for me this is a heart issue. We’ve had a difficult year and I find myself a single mom, homeschooling and running a business and quite honestly I’m isolated and burned out. I don’t want to do this. But, because of your post and the resulting soul seeking, I realize that just because I don’t want to do it, just because it’s hard, doesn’t mean I’m excused from doing it. The Lord called me to homeschool 13 years ago and He has never called me away from it. I’ve been trying to do too much in my own strength, which is quite frankly in short supply. Duh! He doesn’t always ask if we want to do what He has called us to do. He just expects us to obey and gives us what we need to do the job if we rely on Him. And so, I have a new resolve to obey Him and rely on His strength to get me through, hopefully regaining my joy in the process. Although we have never met, I do consider you a blessing in my life and I just wanted you to know that you have made a difference. Thank you and keep up the good work! Thank you for this post! I fall not the group that doesn’t need the feel good you are enough stuff. I need permission for homeschool to not be fun, to not be easy (on me that is). I need to hear that other moms don’t live it but they do it. I actually put my kids in school for a year to take a break. I wasn’t consistent and life circumstances weren’t making that any easier. I’m all for natural learning and learning every day through everything. I do that myself and I love it! But I’m also for academics and learning to study and abroad exposure to content and the “you are good enough” for ME felt like the opposite of encouragement. It felt like people telling me to give up on my vision of a consistent academic looking period if each day! I am finally in my homeschool “home” here on your site. You give grace, but you also tell me to stop whining, get up and do it “good enough” yes I’m an INTJ with Mystie Winckler and I would rather research and plan than do then hassle any day! Thank you again. Denise, I think you are missing what Pam is saying. I didn’t find this post condemning, but very encouraging. 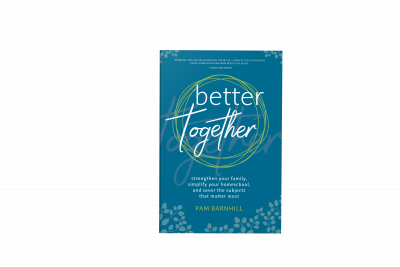 I find it hard to believe that Pam is against flexibility and realising that things will and do put an end to your best laid plans at times. Anyone who has been homeschooling for any length of time would know that if you are not flexible you are not going to last long in the pursuit of home educating your children. Life happens….family members get sick, the dog gets loose and runs off, the kitchen sink pipe springs a leak, the washing machine breaks down, an extended family member or friend dies. Of course you’ve got to be flexible. I think the point Pam is trying to make is that it is easy to get into a habit of making excuses for not doing lessons and failing to get into a good, solid routine. Constantly waking up tired and just not feeling like doing morning time and skill based lessons. If we are going to take on the task of educating our children we don’t have to beat ourselves up with guilt when things go wrong (and life simply happens) but we do have to take it seriously. – are you trying to squeeze too much into the day? 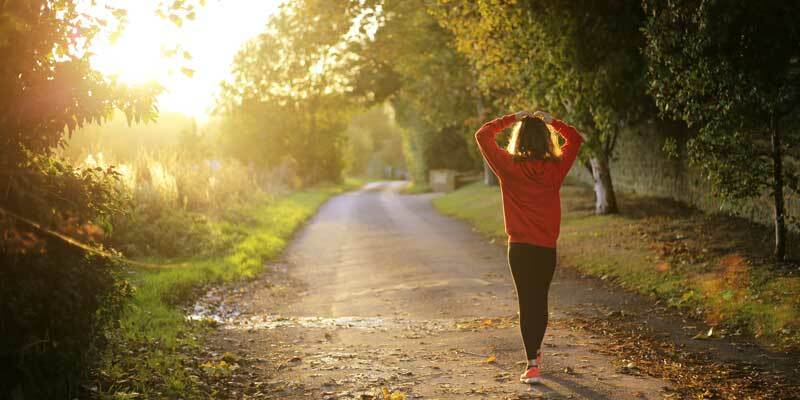 Do the activities in your morning time need to be scaled back? Are you expecting too much sit down time of the kids? – are you giving yourself breathers where you can chill and recharge? For example having a day off once a week where there are no lessons and nothing demanding expected of you….Wednesdays work well, as it’s the middle of the week. – are you planning your school year with adequate breaks? For example a week off every eight weeks or simply through trial and error working out when you get to the point that you all need that week off. For us, eight weeks works well. – it’s an uncomfortable reality but the fact is PMS wreaks havoc with many of us. It’s usually at its worse (when oestrogen and progesterone are at their peak) three to five days before menstruation. Figure out when yours is at its peak and go easy on yourself at this time. Don’t plan much for these particular days and expect that you very well may be short tempered and impatient. I had to come back and reread this. I have no idea why someone would say you were wrong in writing this. I’m not type A yet I’m somewhat of a perfectionist and this really blessed me and spoke deep to me. So thank you!!!! Tough love I needed to hear today! Thank you for your honesty. Ouch. This hurts, but it’s so true. It’s soooo hard to keep ourselves accountable every. single. day. I’ve been a little bit panicky about it as I think about beginning our school year next week. Our callings aren’t easy, but they sanctify us, make us stronger women, and have the possibility of bringing so much GOOD into the lives of our children as we seek to be faithful. Thanks for the hard words. Truth is cleansing. God bless! Seriously, last year was crazy busy and we didn’t accomplish as much as I would have liked. This year I’m keeping appointments all scheduled on one day. That makes for a long day, but I plan their workload accordingly. Since our internet connection at home is very unreliable, we take advantage of online lessons while we’re in town. Our other outside classes/commitments all meet in the afternoons this year so we should be able to get in a full day before having to leave. Thanks for the tips. And the laugh. Thank you so much for this post! I felt so discouraged today and looked online for help when I found this article! I saw your facebook post and I don’t necessarily think you shouldn’t have written this. Yet, I think it’s only helpful for people with a certain homeschool philosophy. For example, we homeschool nearly year round, try to make education a part of life, and don’t do “school at home”. Now, math and reading are two subjects that, in my opinion, MUST be done in a traditional way, but most subjects can be learned in evenings, on weekends, at the park, in a hammock, or when ever or where ever you feel like doing it. 365 days a year are more than enough to get in an education if you make it a way of life. Math and reading take at most an hour per kid per day. However, if you’re limited your education to a school at home situation where everyone sits at their table and does worksheets, you’re going to need consistency because… well, you’re already missing out of the consistency that the “education as a way of life” tribe has. So, I think it’s all about what your particular personality is as well as your particular homeschool philosophy. If you’re checking boxes and sitting at desks, this is the best advice ever. If you’re world travelers who are learning by doing, maybe it’s not as helpful. We are all individuals and when we homeschool, we get to instill our unique values into our kids. My kids will likely never be great at working in a factory or at a desk job. They’ll be pretty awesome at freelance work or as entrepreneurs, though. Kids who do school at home will likely be awesome as business men and women who work in offices but maybe taking risks and living out of the box will be a struggle to them. We can’t have it all or be it all. It’s just not possible. Our kids are going to have failures and weaknesses. Love this! Exactly what I needed to hear. Thank you for this post! Guilty! This was great especially for me-a beginner in home school!